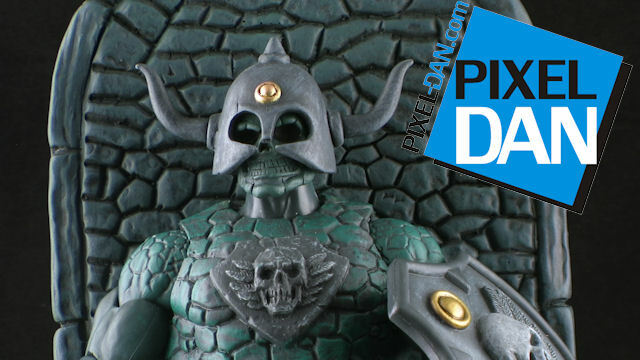 Joe Amaro has teamed up with Castle Grayskullman creator Daniel Benedict to bring you the Castle Warriors Customization Kit, perfect for sprucing up your MOTU Classics Castle Grayskullman action figure! Join me for a look at this set before it goes on sale! The Castle warriors Customization Kit goes on sale on 12/12/2012 only at http://www.CastleWarriors.net ! This set will likely sell out fast, so don’t miss out! WARNING: This is not a toy! It is intended for an adult collector and not children. It is a fan made item and has not been tested. The items contains sharp points and if broken make cause a choking hazard. Buyer accepts all responsibility. -Head has full motion same as a standard production head. I didn't need convincing this time around, but it's always nice to get a PD review before purchase. I just hope I'm lucky enough to get a set. Gah! I really wish I'd picked up multiples of Grayskullman now! Oh man, I did not know it was at the same as Onell! Lame, too late to change it now, sorry! It's 9:03, and it's not up, should I be worried? Got to the payment stage, but before I could finish it was sold out. Less than 10 seconds from the time it came up on the page to Sold Out. I managed to get one, but reading all these comments I wonder how much of these sets were available. Or did some army builder decide to go crazy? Mr. Amaro has put up a form to see if there is interest for another run of this set. I don't understand the point of this. Why the @&$) do you post )$&@ you have like 5 minutes to buy. Is it just meant to annoy the )$&@ out of collectors? Wow that's awesome I would get that! Oh no wait I had 30 secs to buy one of the 5 that were made yesterday awesome….@&&$)@@@&$&&@&$8$)))!!!!!!!!!!!!! Do consider that most customizer make some really cool stuff that either never gets sold or at a very high price. It's one guy, not a big toy company. Also there is a limited pre-order available tomorrow. Hedonism can be like candy.